Have you tried the Archer rivet sets? They make a series of rivets in various sizes that are on decal paper, and you can cut them into strips. The carrier film is so thin and fine it almost disappears under a coat of primer or paint. They are really useful for em-placing lines of rivets, and come in various spacing's and sizes, but must be applied over a painted finish. Much easier to use than a rivet wheel tool or individually embedding rivets. They are pricey though-- about $16 USD for a sheet. I must admit that I haven't tried the Archer sets. Come to think of it, I seem to remember seeing a video on them ages ago. Im going to check them out and splash some cash. Even if I don't use them on this build it will be fun to experiment. Thanks so much for the vote of confidence. I'm not sure what the next subject will be yet, but there will be one. Watch this space for more news. These days I usually build kits in sub assemblies before I paint anything. I say ‘usually’ because I tend to do what seems best at the time and sometimes that means taking a different approach. I also try to build, fill and sand big parts before fitting details. That way I avoid damaging small parts during construction or obscuring places I need to work on. Oh, I test fit a lot too; a few stages ahead if taping parts together allows it. Hmmm, yes, you might say I err on the side of caution. 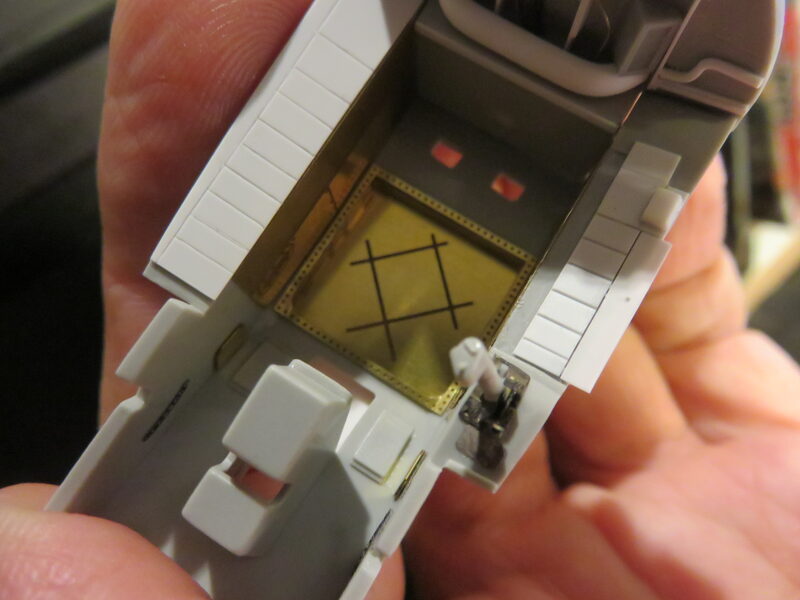 It was during a test fit of the main landing gear bay into the fuselage that I realised this kit offers an interesting option for the general assembly and painting sequence. 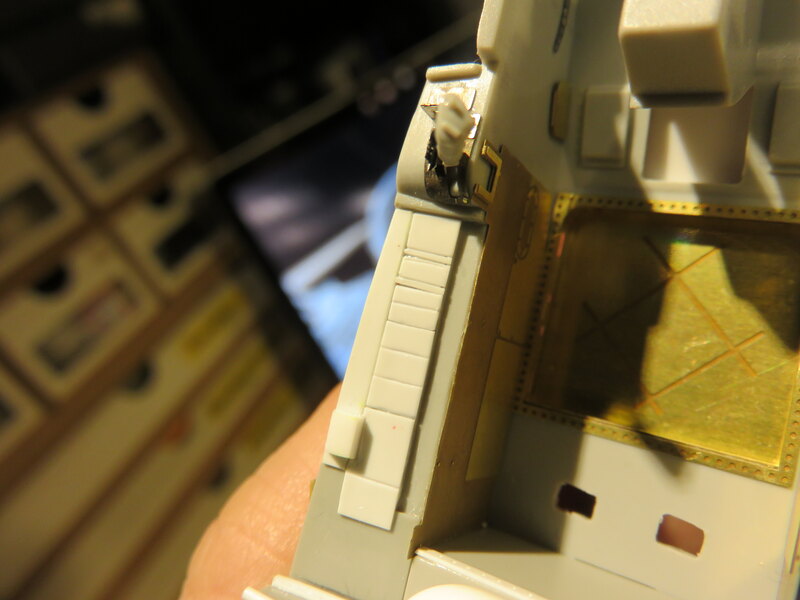 It would be possible to work on the details of the bay, and paint it fully, after it’s attached to the fuselage. What’s more there are only four sub assemblies that must go onto the fuselage before it’s closed: the cockpit, the engine, the electronics bay and the sides of the main landing gear bay. Here’s what the instructions show. So, I have a new plan. Work on the main landing gear is suspended for a bit while I return to the cockpit. I’ll finish that, then build the basics of the electronics bay, make the engine and paint the inside, then join the fuselage halves and do any sanding a filling needed. Finally I'll go back and detail the exposed parts. I can’t remember which general said ‘No plan survives contact with enemy’ or something like that, so I’m staying flexible, but that’s the plan. Here’s an example of why I like to test fit do the big work first. That gap between the fuselage and wheel bay bulkhead will be very difficult to fill once the space is crammed with pipes and cables. And a sneak peak into the future. 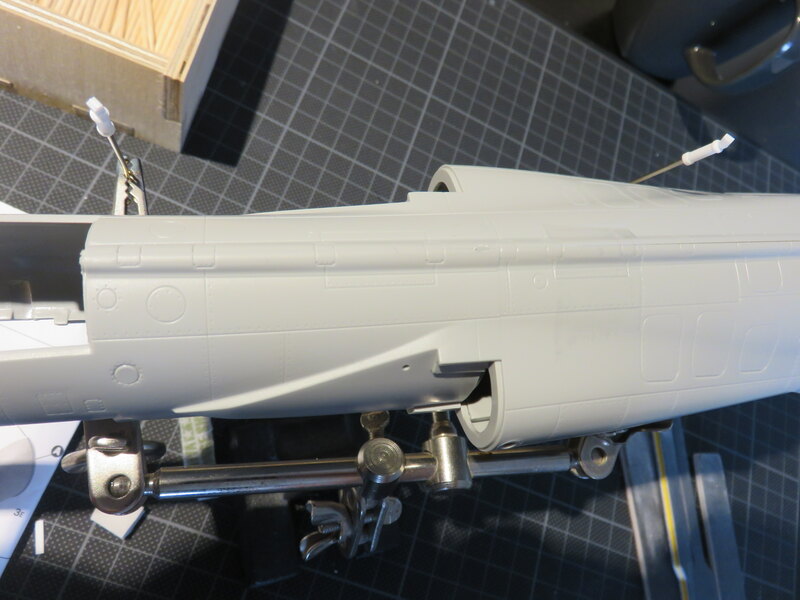 The fuselage looks like it will go together well as long as none of the interior parts cause problems. If you need some zen music while you do tedious tasks like revetting or building tracks try this. I've learned the hard way that most sub assemblies don't fit like a glove, especially on kits that have been around for a while, so I do what you're doing, and dry fit the assemblies needed to close up the fuselage halves, and leave off as much detail and or parts that I can till the halves are glued together. Sometimes it works, some times it doesn't. One thing I've found mighty useful for tight areas where filling and then sanding will be difficult at best, is to use a putty like Vallejo White Acrylic Putty. I apply it, let it set up, then whipe off the excess at any kind of angle rather then straight down the seam with a damp Qtip. The stuff really shrinks, so several applications are always the case. BTW, watched your latest Video, and it's really outstanding. Joel, I reckon yours is the best approach - get the big stuff done and then add details. Sometimes of course we have to do a complete sub-assembly, like an engine or cockpit before the fuselage is joined together, and I hear what you're saying about fit. I almost always make my own construction plan these days because kit supplied instructions would often have us add delicate details before big assembly jobs are done. That seems like a recipe for breaking and losing parts to me, but I've seen guys on line quite happily go about it that way. I use a similar technique to you when it comes to filling, except my favourite filler is Milliput. I like the consistency, and it can be thinned with water too. For thin gaps I use CA glue and for the very thinnest Mr Surfacer 500. Maybe there's a short video on sanding and filling techniques in my future? Thanks again for the constant enthusiasm and encouragement. With Christmas and the New Year celebrations fading fast there’s time to properly return to the F-104. I hope you had a great time yourself if you’ve been celebrating. 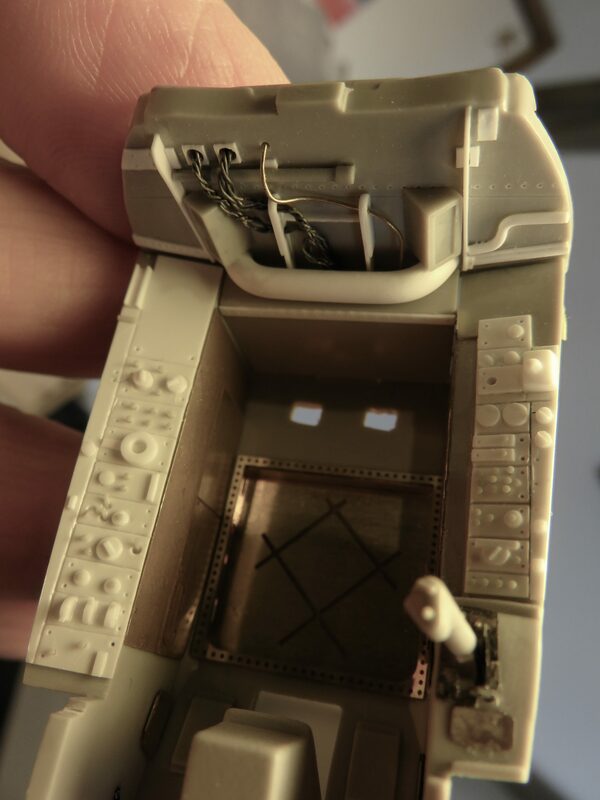 By the way the edges of the cockpit are curved and the plastic card simulating the panels needs to follow the same line. I dealt with this by taping the card in place and then cutting and sanding the edge using the side of the cockpit tub as a guide. I didn’t glue the card in place because I wanted to shape it first and then add the scribing. Only one side was done this way because I took a different approach with the side I needed to repair after my botched attempt at the panels. I thought getting the scribing right would be the trickiest bit. I mucked it up a couple of times and was glad I had the flexibility to start again. Oh, and one last thing. The lines I scribed are out of scale and deliberately so. 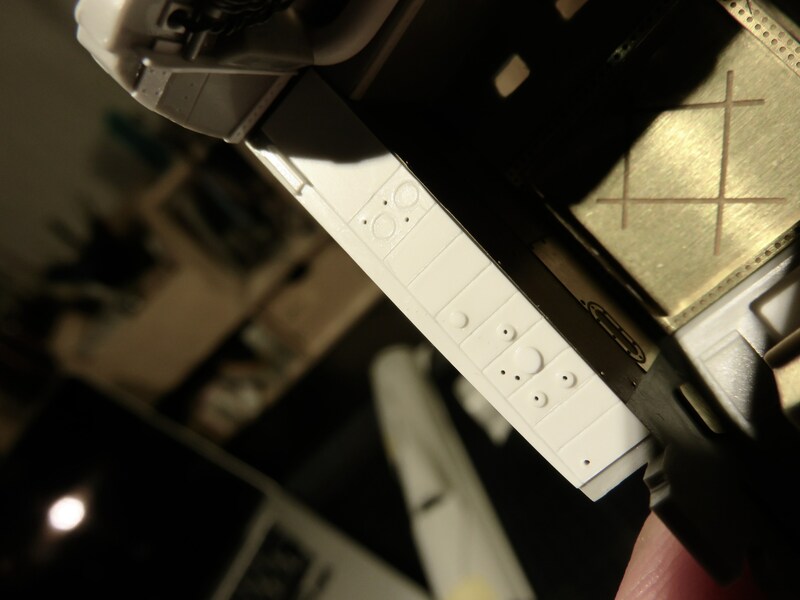 Their main function is to emphasise the panel lines and provide a channel for washes later. With the area inevitably in shadow once the cockpit is in the fuselage I’m exaggerating detail so it stands some chance of being seen. Next up I’ll be adding switches, and I have a plan for those too. It might not be a good plan, but it’s a plan. P.S. If you ever want to remove the coloured printing on Eduard PE, just burn it off with a quick flash from a match or lighter. Then you're left with a standard PE part. 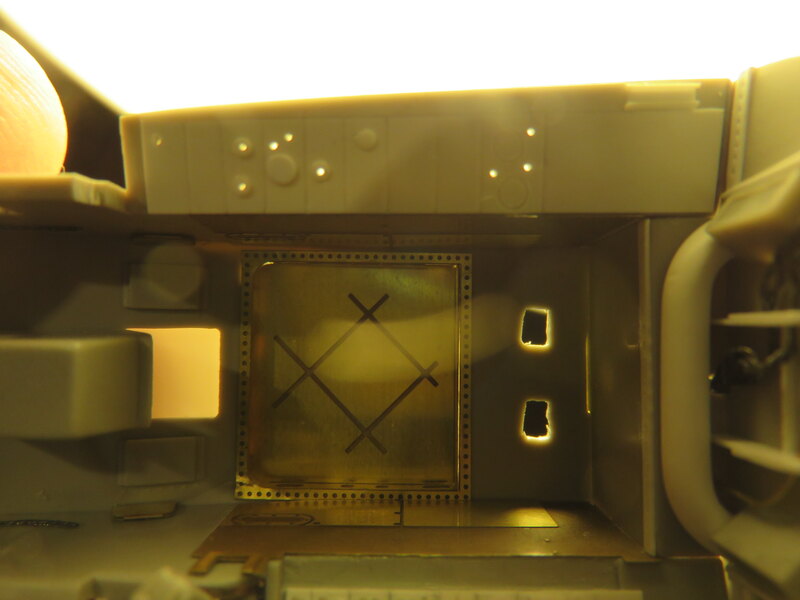 After a week or so working with stretched sprue, tiny sections of plastic rod and using Masterclub rivets as ersatz switches, I’ve ended up with a replica of the side panels that I can eventually paint. It’s not an exact replica but it is close enough for me, and I have to say thanks again to Walter for the link to the virtual cockpit tour. Without that I really would have had to guess. I tried filming all this but the work is just too fiddly and small so instead I thought I’d briefly describe some of the techniques I used. First those switches. Most of them are made by drilling a hole in the right place in the cockpit tub and then supergluing a Masterclub rivet in the hole. I leave the top standing a bit proud a so later washes have something work with. The tail end of the rivet protrudes beneath. I’ve seen other guys put a version of this technique to good effect by using stretched sprue too. I like the rivets because the top is perfectly round and they are made of resin so don't melt away when glue is applied. The larger round dials were made by gluing a small piece of plastic rod in the right place, letting it dry and then carefully sanding it down. I find it so much easier to sand these small pieces once they are in place. I just have to take care not to sand other parts. 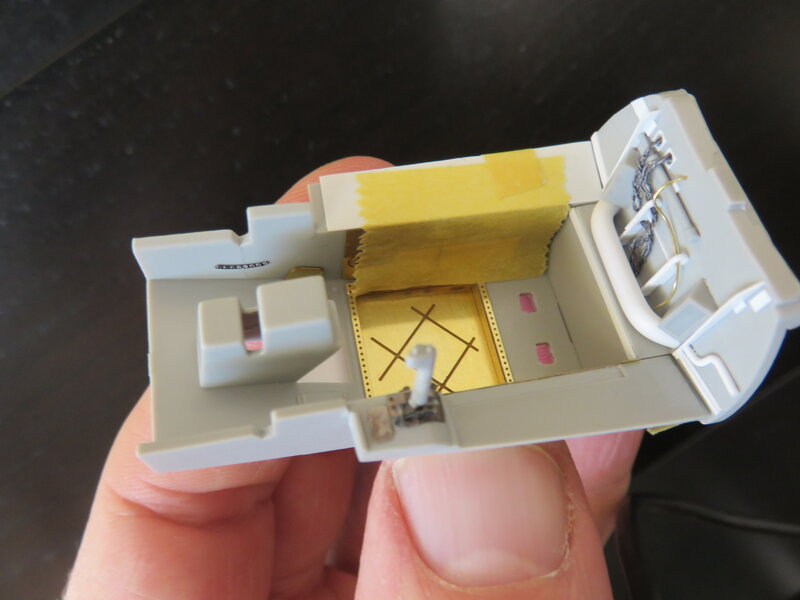 Finally, a small piece of stretched sprue or plastic card is glued on top to simulate the nob. Other details are made in the same way by building up prices cut from plastic card. Oh, and the holes that simulate the screws or rivets holding panels in place are made with that sharpish clay modelling tool I used for the riveting details in the under carriage bay. There are two other essentials for this work. The first is a good amount of patience. I reckon for every one item that I was successful with there’s another one discarded. A pair of magnifying glasses are a must too. P.S. I adjusted the contrast and colour balance in thee shots in an attempt to make the detail more visible. Those detail panels really look great! I've more then impressed with your super detailing. The art of it is making it look as though us mere mortals can accomplish it as well. Well my friend for most of us that just ain't happening. Steve, yep-- I have to agree with everyone else-- your super detailing is well...Super! Can't wait to see what you come up with next! The kit is coming along nicely. I watched your video and gave it it a thumbs up. thanks for sharing that clip. I've been doing something along the same lines with stretched sprue and styrene rods and tubes. I have to agree with your point of glueing the piece in place and then sanding it down to size.... it's a much easier process that I too discovered in the last few weeks. Excellent work on those consoles Steve! Thanks very much. It definitely falls into the category of 'labour of love'. Just a quick post to say that over the next few weeks I'm moving apartments so things might be slow here on the Starfighter blog. I'll try and do some work because I get withdrawal symptoms if I don't but it might not be much. Good luck with the move Steve, and don't forget/lose any parts ! Thanks guys. And I was wondering do you have any tips for packaging up and moving models? I'm worried mine will arrive in bits. Are you moving the models yourself or having movers do it? If you are moving them yourself, I recommend buying some of those plastic boxes with foldable lids, then placing the models inside on towels. I have about twenty of them, and when not used for moving, I use them for storing unbuilt kits in my garage. If you are having movers do it, I use stout cardboard boxes, sectioned off with additional cardboard securely taped to the inside, and then back filled with shredded paper from my office shredder. If possible, the boxes can be placed in wooden foot lockers or trunks, or larger kitchen "dish packs". 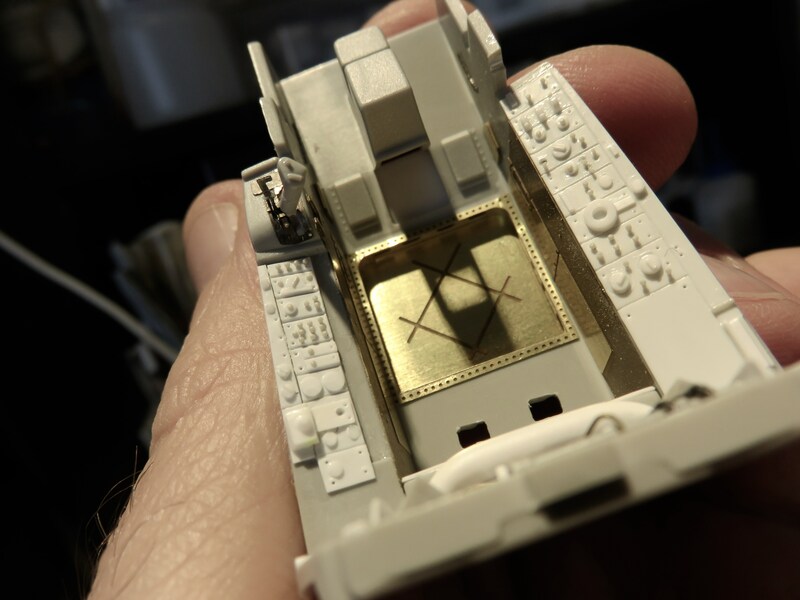 I moved a few models and many 1/16 scale lead miniatures all over the world (over 30 moves) that way when I was in the military. Never had a problem with breakage. Just blow off the shredded paper with your airbrush when you arrive. Its a DIY move, and those tips are great. Thanks a million. I build 1/72 airplanes. In the past, I've placed the plane in a twist tie plastic bag, blow in a little air and tie it closed. I stack it with packing peanuts in a stout box. The peanuts provide some protection, and the bag captures any bits that break or fall off. after a couple of moves I've only lost a few antennas and pitot tubes. It helps if you can remove the propellers too.